This is the latest Miami office tower to trade for a top-dollar price. 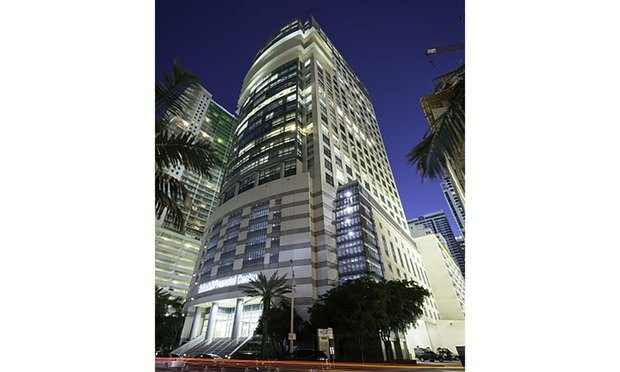 Sabadell Financial Center is a 30-story office tower at 1111 Brickell Ave.
A New York-based global investment firm and an office real estate owner and operator have bought the Sabadell Financial Center office tower in Miami for a reported $250 million. Lidia Dinkova covers South Florida real estate for the Daily Business Review. Contact her at LDinkova@alm.com or 305-347-6665. On Twitter @LidiaDinkova. Three attorneys from Sanchez-Medina, Gonzalez, Quesada, Lage, Gomez & Machado represent a Norwegian company that's pioneered a salmon-farming method to be built in rural Miami-Dade County. The new arrival from Greenberg Traurig focuses on M&A, securities offerings and transaction financing.